This guy is so much fun to watch. His "Food Revolution" program on ABC-TV last year was a not-to-be-missed short series where he took on improving the eating habits of what was billed as "America's unhealthiest city." That was Huntington, WV, deemed unhealthiest based on the percentage of obese citizens and statistics about diabetes and other diseases. (We spent a night there once, by the way, on our way to North Carolina and had a heck of a time finding an acceptable place for dinner.) 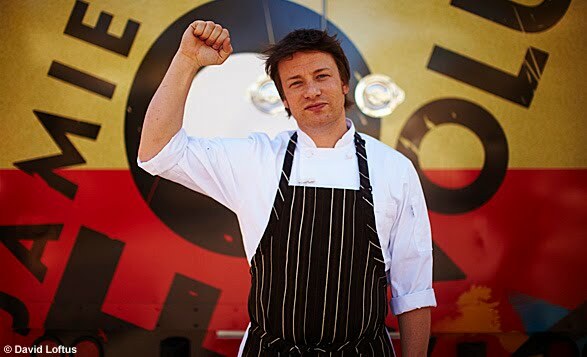 Jamie will back with a new take on his Food Revolution, beginning Tuesday April 12th. The previous season was on Friday nights, so this should be a better time slot for him --at least, it will fit better into my schedule. The Emmy Award-winning series, “Jamie Oliver’s Food Revolution,” takes on Los Angeles when it returns for its second season on Tuesday, April 12 (8:00-9:00 p.m. ET) on the ABC Television Network. In this inspiring series Jamie continues his attack on the problems of obesity, heart disease and diabetes in the US, where children are the first generation not expected to live as long as their parents. Jamie invites viewers to take a stand and change the way they eat in their homes and schools. In season two’s premiere, Jamie arrives in Los Angeles with his wife, Jools, and their four young children. Though his work last season in Huntington, West Virginia, has yielded successful seeds of change, Jamie wants to raise the stakes by focusing on a much bigger area, Los Angeles. However, his overtures towards the local officials at the Los Angeles Unified School District are rebuffed, so he must rethink his approach. He opens Jamie’s Kitchen, located in Westwood, where he’ll provide educational resources and information to help families and individuals combat the obesity epidemic by learning to cook fresh food quickly and inexpensively. For Jamie's first outreach, he invites parents to bring their kids and their school lunches. Appalled by what he learns, he graphically demonstrates to his audience some of the ingredients in their food. By the end of the meeting, the parents have rallied to join Jamie to create local change, but are they powerful enough to reverse the school board decision not to let him into their schools? 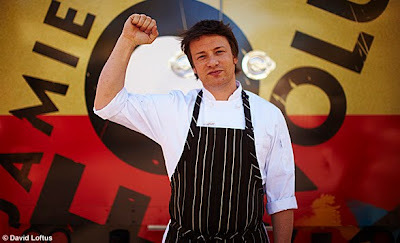 Jamie Oliver’s Food Revolution Season 2 on ABC from Tuesday April 12. Last weekend I got hold of two wonderful spring treats: fiddlehead ferns and fresh porcini mushrooms. They were both at Madison's at Findlay Market. The fiddleheads are especially hard to come by and are only available for a few weeks in the spring. Brian Madison told me the ones he has now are from Portland -- didn't say if it was Oregon or Maine. Nonetheless, they are delicious to add to almost any vegetable saute, or saute on their own with a few seasonings as their own little adornment to your dinner plate. The top photo is of the delicacies themselves. The next series is what I did with mine -- sauteed with chopped fennel bulb, leeks, red and yellow bell pepper, porcini mushrooms and garlic. I served it with a side of rice and mushrooms. My latest wine infatuation has been the Starborough 2009 Sauvignon Blanc, rated 90 by the Wine Spectator. It's widely available and on sale now at several area supermarkets for $11.99 (from $14.99). I'm a huge fan of the New Zealand style of sauvignon blanc, and this one is terrific with the kind of dinners I make -- vegetable based dishes with pasta, rice or polenta, and fish entrees of all kinds, especially when prepared with lemon, olives, herbs and/or peppers. Starborough is made in the Marlborough region of NZ. Click here to visit their website. While we're on the subject of wine bargains, check out the advice from Food & Wine's wine expert, Ray Isle, who is also a contributor to the Today Show. Click here for a link to some of his suggestions for wines as low as $10 a bottle that are made by the tens of thousands of cases and go great with food. For April Fool's Day: Serve a "Fool"
I don't mean make dinner for a goofy person....instead, whip up a simple, traditional dessert called a fool. The idea comes from an Australian Food Blog I read called Foodista. Here is a quick quote from the site about this fun dessert. Click on any of the titles for a recipe. Pictured is one of their berry versions. The fool hails from around 15th century England and was traditionally made with gooseberries. It's a simple dessert that combines fruit with cream. Try serving with a garnish of mint or a nice shortbread cookie. Gooseberries are tart and full of flavor. It's a wee bit early in the season for this little berry, so look for freshly frozen ones. 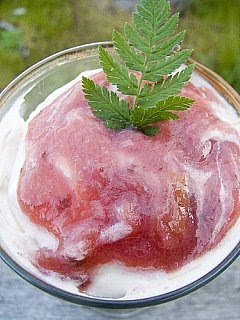 Rhubarb is the classic spring fruit fool! Check your local farmer's market now for this delicious edible plant. This berry-licious version has a splash of Chambord. Yum! A great way to use up any of those remaining cans of Thanksgiving cranberry sauce! Like a kiss from the tropics! Even though the weather has turned cold again -- and there's even a couple of inches of snow in our forecast for the weekend -- the calendar says it is spring. Therefore, let's celebrate some of the season's best crops. 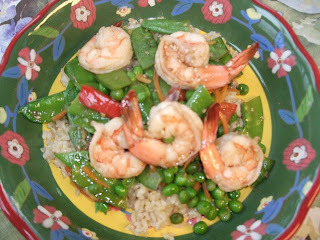 Today, I'm thinking about peas: snow peas, sugar snaps and "spring" (green) peas. This recipe is yummy without the shrimp, but I wanted to include some protein. Served over brown rice, it's a complete dinner. You can substitute bite-size chunks of raw chicken breast for the shrimp, or go with veggies only. Heat oil in a large skillet over medium high heat. Add ginger, garlic and pepper flakes and stir-fry until fragrant, about one minute. Add bell pepper and stir well, then add snow and sugar snap peas. Stir-fry for about 3 minutes until peas begin to soften. Add green peas and stock, stirring well. When mixture is thoroughly heated – about another 2 minutes – add shrimp. Stir-fry until shrimp turns pink, another 3-4 minutes. Remove from heat and add soy sauce and sesame oil, mixing well. Serve over brown rice and sprinkle with sesame seeds. 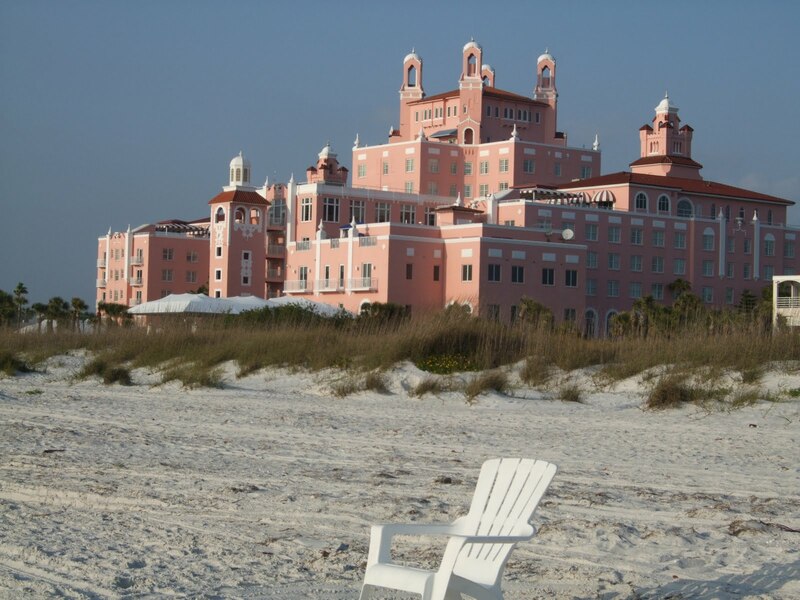 Having spent a mere 4 "Spring break" days in the Tampa Bay area, I still managed to gain a few pounds thanks to too many cocktails, not enough exercise and plenty of caloric indulgences. 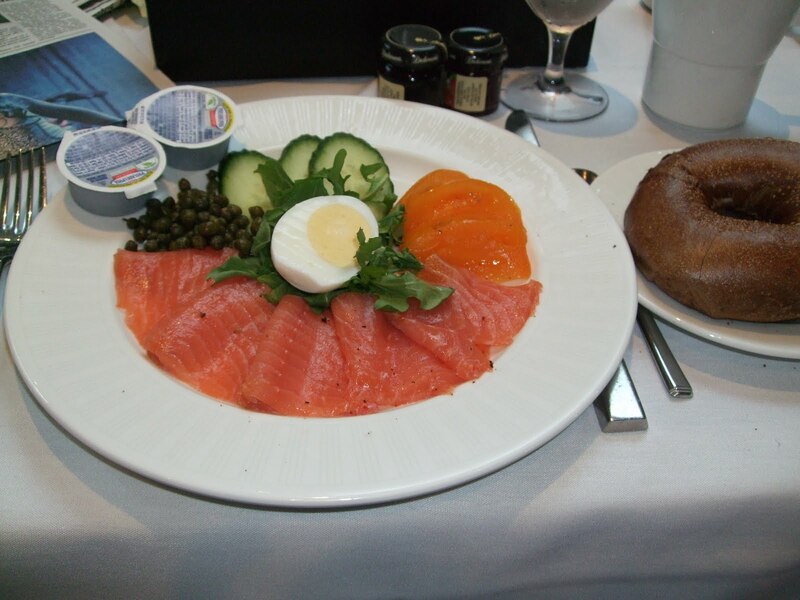 The best food I had, though, turned out to be breakfast or brunch dishes. Here are some of the highlights. 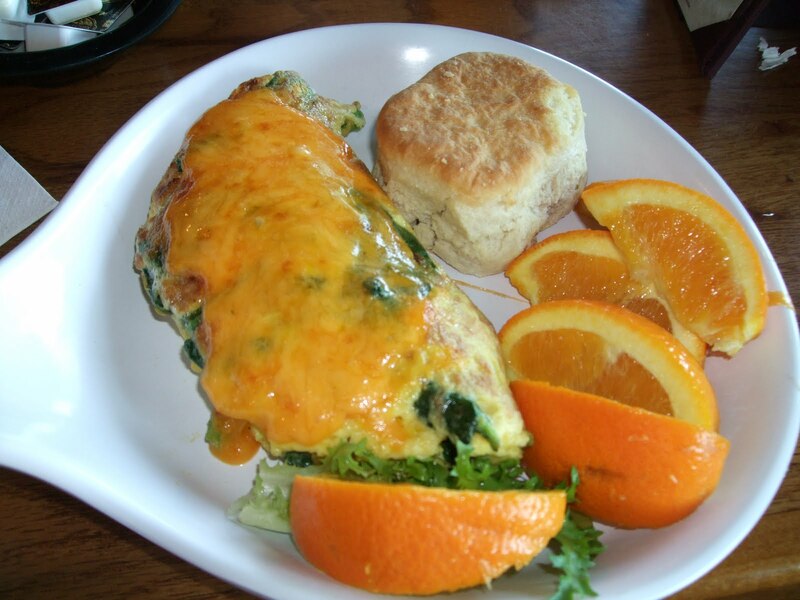 An omelet at a waterside restaurant in the touristy town of John's Pass (top photo) hit the spot. It was loaded with veggies -- broccoli, spinach and mushrooms -- and as you can see, covered with cheddar cheese. The biscuit that came with it was very nice, and I asked for orange slices rather than home fries. Still, this was a brunch that added to my "bad girl" eating binge. 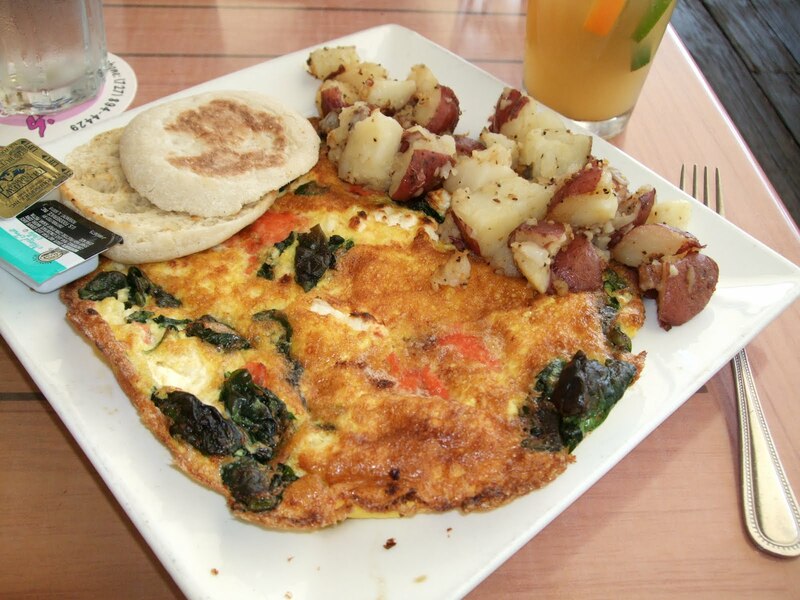 The frittata (middle photo) was from Fresca, a place that had great sangria. This smoked salmon frittata was overcooked, however. But the management took it off our bill, which was nice. 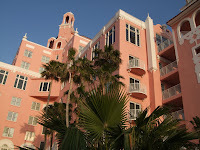 Probably my favorite breakfast was at my hotel, the Don Cesar Resort, on St. Pete Beach. The melon with berries was not only beautifully presented but also sweet, fresh and delicious. 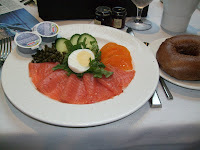 After that, I had a toasted whole wheat bagel with smoked salmon. I only ate half the bagel, and skipped lunch that day, but still: fat city! I've also posted a couple of shots of the Don Cesar resort, quite a lovely place. All I wanted to say is that even though I try to eat relatively healthfully on vacation, it still is my worst track record. I got home this morning and will have to go back to regular eating and exercise for a couple of days before I dare get on a scale. But the beach was beautiful, and I'll get back on track! M - Make it a point to eat only at MEALTIMES; snacking between meals can cause you to overaeat or to fill up on unhealthy snacks instead of nutritious foods. N - Choose foods that are high in NUTRITION that give you the nutrients your body needs. Q - QUIT the red meat in your diet, opting instead for seafood, beans or poultry. S - If you must snack, SNACK on healthy foods. T - Take enough TIME to eat your meals -- rushing leads to overeating. U - UNDO bad eating habits, such as snacking at every opportunity, keeping candy in your desk and dipping in too often, skipping breakfast, and so on. V - Eat VEGETARIAN meals at least a couple of times a week -- it's not hard. Think pasta with red sauce or stir-fried Asian veggies with brown rice and soy sauce. W - Realize that you have to WORK to maintain a healthy eating plan. Start by working in one good habit a week, and soon you'll have it all down. X - Try not to make eXceptions to the rule of eating healthfully at every meal. If you slip up, start again at your very next meal! Y - Keep food YEARNINGS at bay by not denying yourself foods you really love, even those that are not high on the healthy foodie chain. Just have a little bit. Z - Wait at least an hour after eating before you get your ZZZZs; sleeping right after a meal can cause indigestion, heartburn, poor sleep and can contribute to becoming overweight. 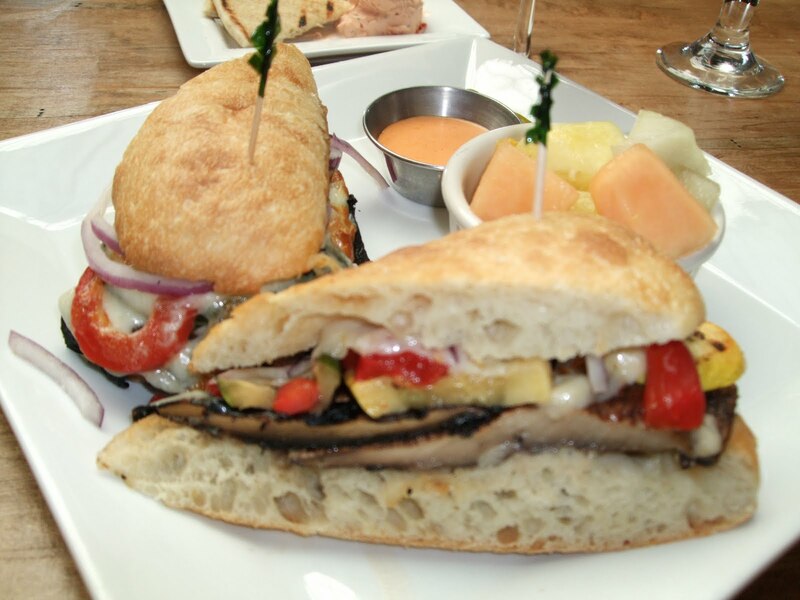 This weekend you can still catch the Restaurant Week deals at many area eateries. 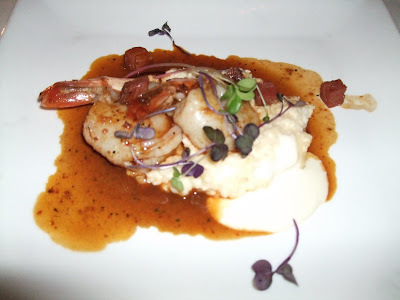 Last night I went with friends to Hugo's in Oakley, and tried the yummy shrimp and grits (in photo). It's not a light or especially healthy dish, so the smaller restaurant-week portion was a great way to indulge without going over the top. Click on the link above to see what restaurants are in this game. Hugo's, along with quite a few others, are offering a three-course meal for $26.11, not including tax and tip -- or liquor, of course. 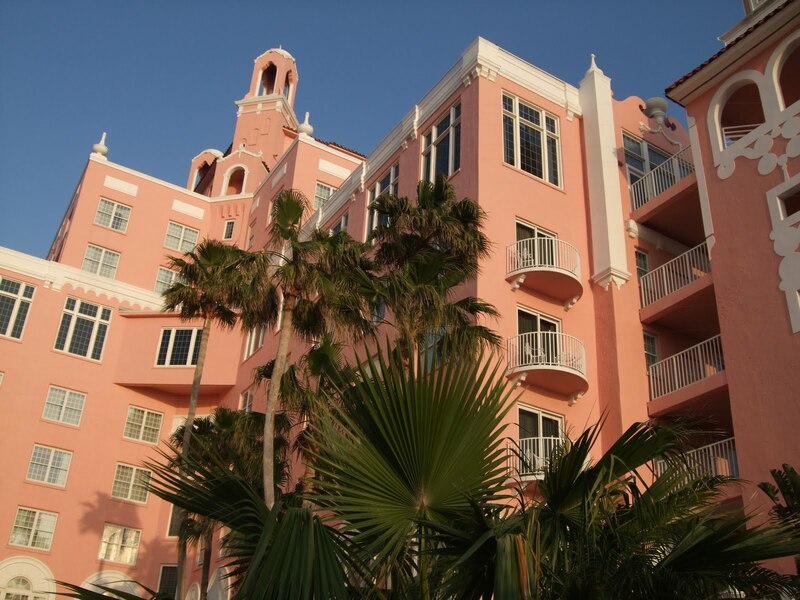 Official dates for the deals are March 11-20, which is a little longer than a week. Guest blogger Maureen Denard sent me her "A to Z of Healthy Eating." It's long, though -- longer than I usually like to make my posts -- so today I'm going to run A - L, with the rest to come soon! A – Add more fruits and vegetables to your diet – they’re rich in vitamins and nutrients that help keep you fit as a fiddle. B – Breakfast is important; never skip the first meal of the day because it boosts your metabolism and gives you energy to get through the day. 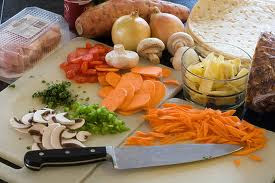 C – Carbohydrates must be eaten in moderate amounts – choose good carbs like fruits and veggies and whole grains which metabolize slowly and release sugar into your bloodstream gradually; avoid bad carbs like processed food, junk food and others which spike your blood sugar level and add to your weight woes. D – Diet sensibly – starving yourself is a bad idea since it gives rise to binges. 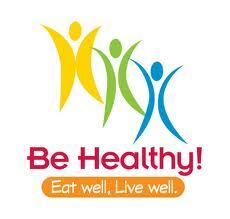 Eat healthy and small meals, five to six times a day. E – Eat slowly, chew your food well, and minimize your portions; stop eating just before you start to feel full. F – Fatty foods must be avoided – steer clear of sugary snacks, ice creams, cakes, pastries, fast food and other items that contain saturated fat or processed ingredients. G – Get moving – for any diet to achieve greater value, exercise is a must; so get rid of your sedentary lifestyle and start becoming more active. H – Eat all your meals at the same hour every day; when you have set mealtimes, your body does not have to make adjustments each day. I – Increase the number of meals you eat, and limit the amount you eat during each meal; small meals every few hours maximize your metabolism and boost your health. J – Jumpstart your day with a glass of fresh juice instead of resorting to caffeine-laden cups of coffee. K – Kiss goodbye bad habits like smoking and drinking too much – they negate the nutritive value of food and contribute to bad health. 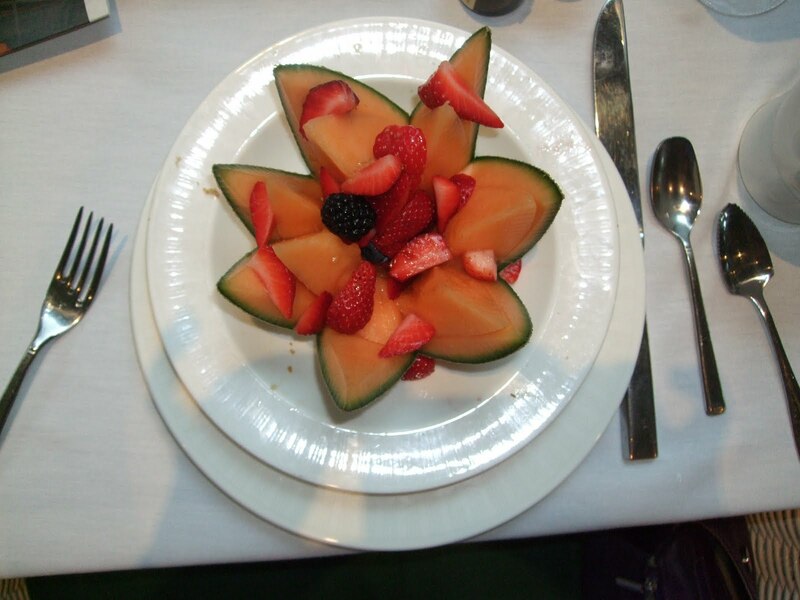 L – Love what’s on your plate – this way, you don’t avoid any food that’s good for you. Learn to love it because it adds to your health and helps you lose weight. This guest post is contributed by Maureen Denard, who writes on various subjects at Online MSN Degree . Maureen can be reached at her email id: denard12.maureen@gmail.com . This pudding recipe is from my friend, Mary Ann Barnes. She excels at making healthy desserts, and her brown rice pudding is another winner. Brown rice is much more nutritious than white -- though I love them both -- and the addition of lovely fruits make it a scrumptious ending to any meal. By the way, I never cook brown rice from scratch any more, now that you can get the frozen boxes with microwaveable packets of pre-cooked rice. Place rice, coconut milk, skim milk, cardamom and cinnamon in a medium sauce pan. Cook over medium heat, whisking frequently, until boiling, and then about 5 minutes longer, until slightly thickened. Remove from heat and stir in pistachios. Cool a little, then spoon into serving dishes and cover with plastic wrap and refrigerate until served. Top with fresh mango and strawberries. The mini-chain based in Columbus OH, Wine Guy, opened a Cincinnati location last fall. By coincidence, their opening happened at almost the exact time as another wine-oriented restaurant started up--La Poste in Clifton. As someone who drinks wine with almost every dinner, home or away, I tried both of them within a week of their debuts. As readers of this blog probably have noticed, La Poste was an immediate hit with me. They have a sommelier, one of the few in the city and definitely the only one in my 'hood, Clifton. The food passes foodie muster, but it was and is the adventurous, unusual wine selections that impresses the most. My first experience at Wine Guy was much less happy, in part because I look for healthier menu choices and had a hard time finding any on their menu, but mostly because I was so disappointed in the wine selection. It was just all too familiar, IMHO. So this week I decided to give the place another try. (I can't even explain why it took me so long to have that brilliant idea -- duh!) I slipped in on my own for lunch, when it's not anything like as noisy as it was the Saturday night of my previous visit. Well, it was a much nicer experience. 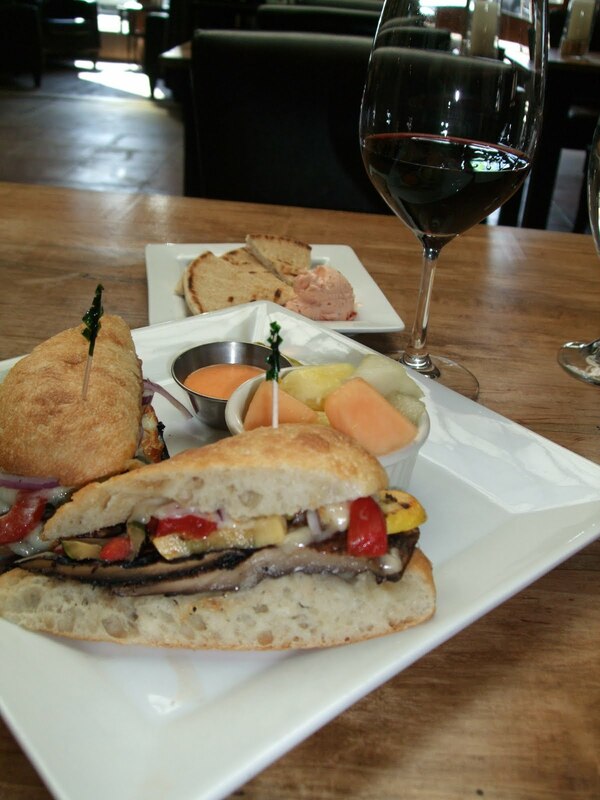 While I still had a bit of a time finding an appealing food choice and had to ponder the wine list awhile as well to get past the stuff I've had all too often, I did come up with a satisfying meal. By selecting from the premium wines by the glass at the bottom of the list, I found a delicious California pinot noir, not inexpensive (about $13 for a good pour) but it was worth it. For food, I had a well-prepared grilled vegetable ciabatta ($8.99), which came with either chips or a small fruit cup. The only false note was that the fruit seemed to have been cut up not all that recently, but the sandwich was delicious and I ate the whole thing. The waiter was friendly and answered my questions about the restaurant and listened kindly to my suggestions about kicking up the wine list. Wine Guy is also a wine shop, and its shelves contain lots of really interesting bottles. While you can select any bottle and drink it at your table for an additional $10 corkage fee, I wish they would include more of those unusual selections by the glass and (even better) in their flights. One of the things that excited me about this place was that they offer flights of wine, which almost nobody in this town does. But as of now, there's not one of their flights that tempts me. My waiter said they're about to redo the wine list soon, and I do hope they'll make at least one of the flights something outside the box of chardonnay, cabernet, Italian reds, and so on. The restaurant is in a prime location, the space is inviting, I love the bar area and the wine shop is first rate. Good luck to Wine Guy, and I promise to keep checking it out. 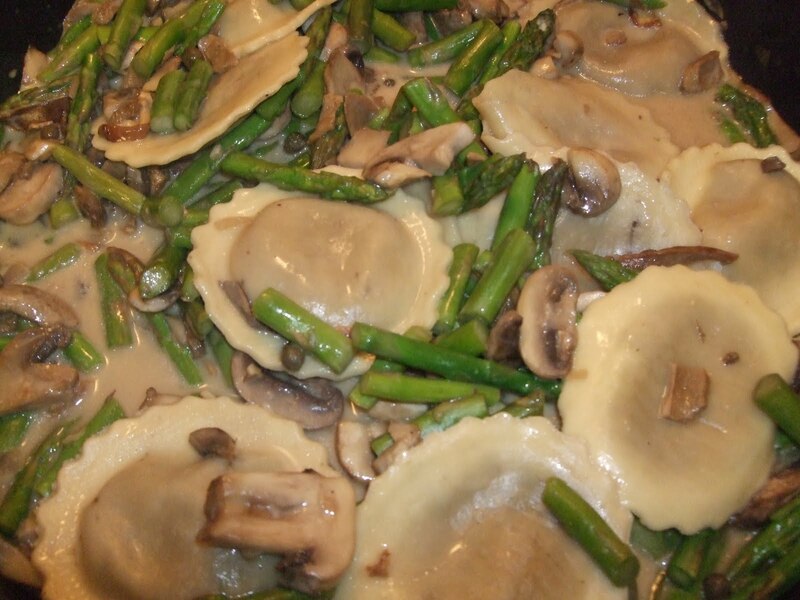 This week's menu included an omelet with veggies, cheese and a little shaved black truffle (it's the season), and another night we had pre-made mushroom ravioli with a mushroom/sour cream sauce. 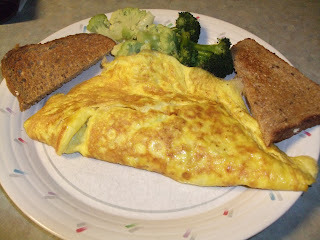 For an egg supper, I'll always include a green veggie on the side (steamed broccoli here) and a slice or two of whole-grain toast. The ravioli sauce--which would be excellent on any kind of pasta--started with sauteed mushrooms and shallots, then adding about a cup of soaked, dried porcini mushrooms with their soaking liquid. To get a little green in the dish, I included about 1/2 pound of asparagus spears, cut into 1-2 inch pieces. If you have some on hand, a half-cup of white wine would be a delicious addition, or use stock/broth. After the sauce is heated through, remove from heat and stir in about 2/3 cup of reduced fat sour cream. The ravioli came from Trader Joe's, where there are many varieties from which to choose. Most supermarkets these days also have premade ravioli or other stuffed pasta in a refrigerator case. 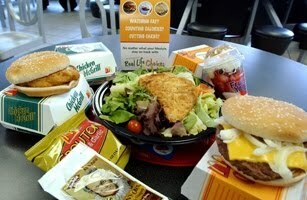 Is there any such thing as Healthy Fast Food? "Recently, the New York Times food columnist Mark Bittman examined the nutritional merits of McDonald's Fruit & Maple Oatmeal, an apparently "healthy" breakfast item that actually contains more sugar than a Snickers bar and only 10 fewer calories than an Egg McMuffin. Yikes. But while it's easy to supersize our scorn for McDonald's, it's also worth noting that Mickey D's isn't playing the only shell game in town. CLICK ON this link to read what's really in the fast-food dishes that sound like healthy choices when they are anything but. For instance, the piece on Time Magazine's website dissects such entrees as the McDonald's grilled chicken Caesar salad (22 fillers and additives in the chicken); the Jamba Juice "light" mango smoothie (85 grams of sugar in a regular size) and Applebee's sirloin with garlic herb shrimp (only 500 calories, but laden with 21 grams of fat and over 2,000 grams of sodium). It's enough to make you want to eat at home, all the time! I had an email from a blogger who turned me on to her website and an a recent article there about ethical eating. According to the article, ethical eating refers to paying attention to where your food comes from and how what you eat has an impact on other humans, animals and the environment. 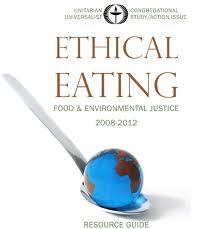 Ethical eating makes us better stewards of our planet, among other things, which makes it worth considering, I believe. The article, "40 Easy Ways to Eat more Ethically," has lots (40, obviously!) 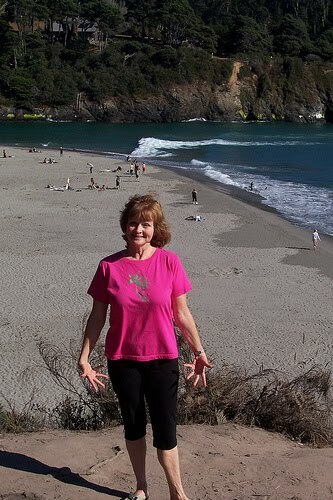 of suggestions about how to become more aware of the ethical ramifications of what we put into our bodies. Here are just a few, or click on the article title to see the whole list. Thanks to Celina Jacobson at Masters in Health Care for the info! With warmer weather on the horizon, I'll be more likely to mix in a fair number of white wines with the healthy reds. What are your favorite white wines? I tend toward New Zealand sauvignon blanc, white Burgundy, and a few oddball choices like Argentina's torrontes and Oregon pinot gris. Food & Wine has a feature on their website about the world's best white wine regions. 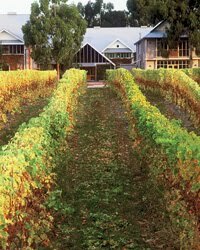 It includes New Zealand (the photo is of Cloudy Bay vineyards in the Marlborough region) and Burgundy, but also the rieslings of Mosel, Germany, France's Loire Valley for its chenin blancs and Fruili in Italy for superior pinot grigio. The website includes suggested specific bottlings as well as tips for pairing food with each of these types of wine. Ah, what a great way to welcome spring -- and summer! I have just discovered Food News Journal, which updates daily with a page of links to news about food from sources such as local and regional newspapers, television networks, blogs and wire services. For March 1st, the stories range from a CNN piece headlined "Rich Americans Flock to Fast Food" (why?) to "Students gather at food and justice summit" from the Kansas City Star. There's also a section on Wine & Spirits -- today's links include a story "Restaurant Prices -- What's Fair?" -- as well as a daily recipe, notices about important food events around the nation, and a bookstore. You can go to the website at your convenience, or sign up to receive a daily email.